General Motors announced on Tuesday that it would close seven factories and cut its workforce by 14,000 people. The announcement was met with criticism from President Trump, Senators Sherrod Brown and Rob Portman, and many others. Of the plants that are due to close, four are in the United States and one is in Canada. While politicians can criticize the company all they want, GM is a for-profit corporation and what they did was the responsible thing to do. Corporations have an obligation to their owners—the shareholders. That obligation is to make money and pass some of the profits on to the shareholders. Yes, I sympathize with the workers that will lose their jobs as a result of the plant closures, but the company itself has to think about the bigger picture. Many of the comments criticizing GM, from people on both sides of the political aisle, are pointing to the recent tax cuts and the fact that the company saved $340 million from the tax law changes that were implemented at the end of last year. Unfortunately, tax cuts do not create demand for goods. And that in a nutshell with giving tax cuts in hopes of improving the economy. Giving a corporation a tax cut will improve the profitability of the company, but it doesn’t necessarily mean that the company will spend the profits to produce more goods. Companies only produce more goods if there is a demand for the goods. I tried to make this same point two weeks ago with an article about oil. President Trump is pressuring oil producing companies and countries to maintain current production levels while OPEC is lowering demand projections. For companies to continue producing at the same level while demand is falling would be irresponsible and it would damage both the company and the economy. If indeed the demand falls like OPEC expects, keeping production at the same levels would lead to a surplus in supply, and that would cause oil prices to fall even farther. The surplus would also stall any sort of a rebound in price as consumption would have to work its way through the excess supply before it reaches the need for the companies to boost production. The same thing will happen if GM continues to produce cars that aren’t in great demand. If they produce a car and the demand for the car is low, they have to discount the price to sell it. This hurts profitability. If they continue the same production levels just for the sake of keeping employees working, they will end up with a surplus of vehicles with low demand. It is the most basic tenet of economics—if supply outpaces demand, the price will fall. This whole story is emblematic of the problem with the most recent tax cut. The tax cuts were nice, and they lifted the stock market for a while, but from what we have seen so far, they didn’t increase the demand for most goods. Companies are posting record profits, but they are giving a lowered forecast for 2019. This is what led to a great deal of the selling that we saw in October. With 90% of the S&P 500 companies reporting in the current earnings season, 78% beat their earnings forecast, but 40% came up short on the revenue estimate. This is a sign of slowing demand as the revenue is the result of consumption. In addition to so many revenue misses, a number of companies issued a lower forecast for 2019. Politicians can get upset and voice their criticisms all they want, but the economy is cyclical, and we have been in an economic expansion for quite some time now. We are due for an economic slowdown. Yes, that would hurt politicians that are currently in office with their re-election bids, so it is understandable that they are upset with GM’s announcement. The fact of the matter is, GM is being responsible to the shareholders and to the rest of the workforce by closing plants that are producing cars that aren’t in great demand. 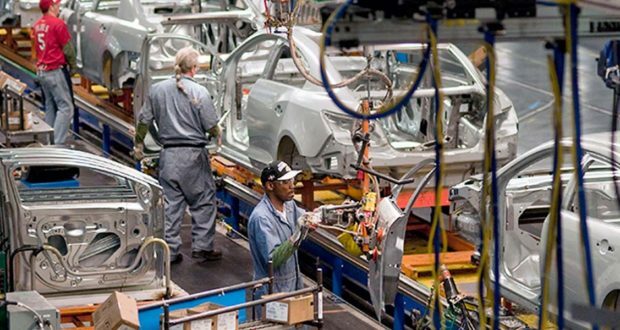 If they kept the plants open and continued to produce cars that aren’t selling, they would jeopardize the good of the whole company and the jobs of approximately 165,000 other workers. Sure, it is awful news for the workers at these plants and the communities where they are located, but that is better than having the entire country impacted. Why doesn’t GM just retool and make some other vehicle at those plants that are closing? Basic economics seem to be a foreign language to nearly all politicians. Socialists are even worse…Venezuela is a socialist paradise. Under real free market conditions, I would agree with you. However, this is not a free market condition – not that free markets still exist in any event. GM was bailed out and subsidized at taxpayer expense. They should have been bankrupted years ago. The ‘Volt’ is a classic example. It never should have been developed and marketed. It was totally overpriced and could not compete with hybrids sold by viable auto manufacturers. We the people bailed out GM with our tax dollars, which they spent in China!!! How about GM close those plants in China and bring some of those jobs home!!! …..Amen. I also cited that same issue. The scam goes on even though so many of us taxpayers are also “stockholders”? I DO NOT THINK RICK’S USUMPTION OF HOW GM GOT IN THIS MESS IS CORRECT.IF THEY WOULD HAVE FOLLOWED THE PATH FORD TOOK WHEN OBAMA WAS TRYING TO SHOVEL GLOBAL WARMING AND GREEN HOUSE GASES DOWN EVERYBODYS THROATS THEY WOULD NOT HAVE THIS ISSUE.PRODUCING CARS THAT ARE NOT IN DEMAND BUT ASSUMING THEY WILL BE IN THE FUTURE IS IRISPONSIBLE MISMANAGMENT AND THAT IS WHAT HAPPENS WHEN YOU TRY TO PREDICT THE FUTURE UNDER A FAILED 8 YEAR LEFTUS DEMOCRAT PRESIDENT,I REST MY CASE. GM took their taxpayer bailout to the tune of BILLIONS less than 10 years ago ( I guess that makes us “shareholders”, too?) and went almost all in on “for profit” china, viet nam and other foreign investments. It was just a matter of time before they would now start culling their non money making write-offs. Once they’re gone, GM’s involvement with unions and spoiled employees will be almost over. It’s all a game and the players (politicians and big business hot shots) always win no matter what. It would be more informative to relate the problems at GM with a more pertinent government action that encouraged GM to make automobiles that were not in high demand. Cash for clunkers was one example of government intervention in the automobile market that skewed demand for new cars. Plain and simple, Government Motor Corporation should be SHUT DOWN!!!! Enough is enough, they have been on the public lifeline since the 1970’s. They (GM) and technology have eliminated jobs as time has passed. More and more jobs are lost every day/year to automation of manufacturing processes. So lets kill this LEECH of the “American Taxpayer”!!! Do Cryptocurrencies Gain Credibility From Bitcoin Futures Listing?